Freedom and Flourishing: Is there a close relationship between subjective and objective indicators of environmental protection? 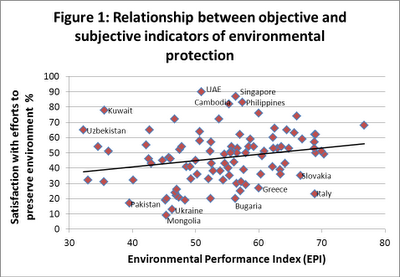 Is there a close relationship between subjective and objective indicators of environmental protection? The subjective indicator of environmental protection that I have in mind is data from the Gallup World Poll on the percentage of respondents who say they are satisfied with efforts to preserve the natural environment. I have used this as one of several indicators of opportunity for individual human flourishing in a draft of Chapter 6 of ‘Free to Flourish’, the book I have been writing. The objective indicator of environmental protection that I have in mind is the Environmental Performance Index (EPI) which is the result of a major collaborative project of research agencies associated with Yale and Colombia universities. The EPI is calculated on the basis of 22 performance indicators reflecting facets of environmental public health and ecosystem vitality. The relationship between the two indexes is shown in Figure 1 below. In broad terms, the relationship is positive, but not close. The people in some countries (e.g. 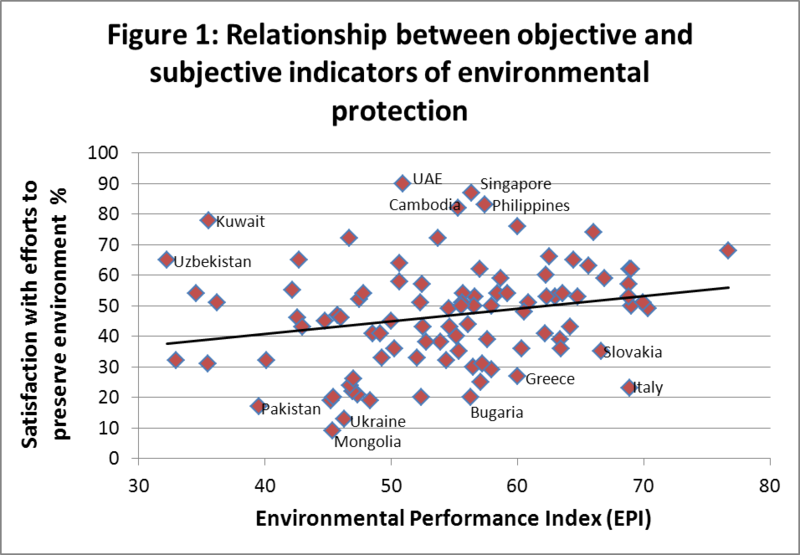 Kuwait, United Arab Emirates and Singapore) seem to be much more satisfied with efforts to protect the environment than would be predicted on the basis of objective indicators. By contrast, the people in some other countries (e.g. Mongolia, Bulgaria and Italy) seem to be much less satisfied with efforts to protect the environment than would be predicted on that basis. Some light is shed on what seems to be happening by a regression analysis which seeks to explain satisfaction with efforts to protect the environment in terms of government effectiveness (using the relevant indicator in the World Bank’s suite of governance indicators) and the EPI. 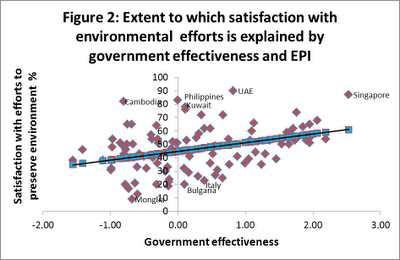 The analysis suggests that the governance variable is much more important than the EPI in explaining satisfaction with efforts to protect the environment. This is shown graphically in Figure 2, which plots the satisfaction variable against government effectiveness. The points shown as blue squares are the predicted values for each country based on the multiple regression (including both of the explanatory variables). The values barely diverge from the black line in which the government effectiveness variable is the only explanatory variable. 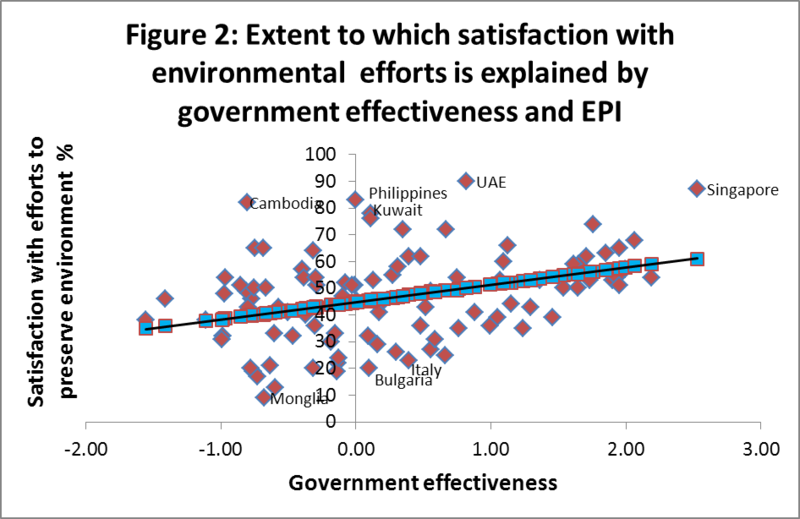 My conclusion is that satisfaction with efforts to protect the environment is more a measure of satisfaction with governance than a measure of environmental protection. On this basis it would probably be preferable to use the EPI as an indicator of the impact that environmental factors are likely to have on opportunities for individual human flourishing.I am using the EPI in the latest draft of Chapter 6 of 'Free to Flourish'.